Modern, online flight scheduling for your flight school, flying club or rental fleet. FLY Online Tools provides innovative online solutions for flight scheduling, operations, aircraft maintenance and flight training syllabus tracking. 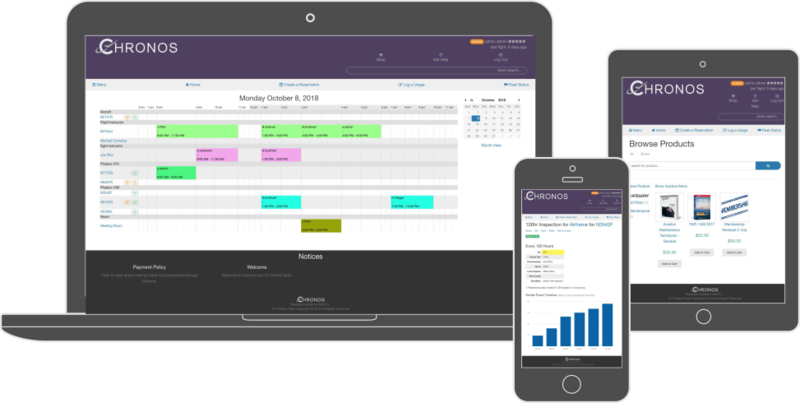 Visual calendar based scheduling gives your customers easy access to aircraft reservations. Track the usage of all of your resources: aircraft, flight instructors, meeting rooms, simulators. 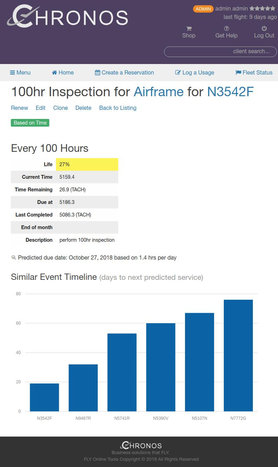 View real-time Fleet Status of maintenance reminders. Connect your merchant gateway and enable your customers to pay their account balance directly. 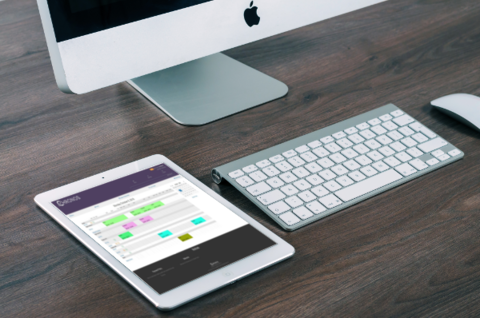 Put billing on auto pilot and never mail paper invoices again. Automatically export invoices, payments and sales receipts to Quickbooks Online. Update your accounting books swiftly and easily. Compatible with any browser based device. All FLY Online Tools apps are browser responsive and work great at the smart phone, tablet, laptop and desktop computer screen formats. There is no software to install, and you may be logged in from many devices simultaneously. Connections are HTTPS secure. Usage tracking feeds accounting and maintenance status. After each flight, your customers will create a usage entry that logs hobbs, tach, cycles, landings, oil consumption, or any other custom 'timer' that you configure. Customer accounts are automatically billed and the aircraft maintenance statuses updated. Customers may also report squawks after their flight. Aircraft maintenance status is shown next to the aircraft in the calendar and on a master Fleet Status report. Flight time based maintenance reminders are predicted based on usage analytics that convert "10 hours due" to "predicted due date is Monday." Create professional leaseback statements and payments. Design a cost model for lease backs that include: revenues, maintenance expenses, engine fund, admin fees. Chronos will automatically update the lease account when usages are logged. Print a monthly leaseback statement and export the payment check directly to Quickbooks Online. If you operate a fleet of five leased aircraft, it only takes about 10 minutes to process statements and checks for the fleet. Streamline your accounting with Quickbooks Online integration. Smart invoice and sales receipt creation minimizes manual effort in Quickbooks. As customers make payments to settle their accounts, the appropriate documents will be created in Quickbooks Online automatically (invoices, payments, sales receipts). 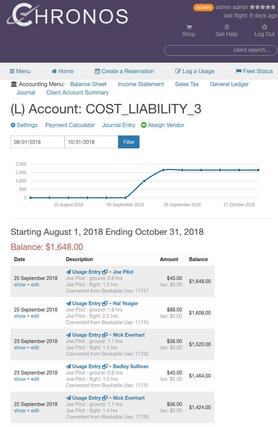 Your income statement, balance sheet, and bank statement will always be up to date, with minimal effort required to reconcile your transactions in Quickbooks Online. Control access to aircraft with many checks and balances. Some policy control may be fulfilled by the customer (e.g. 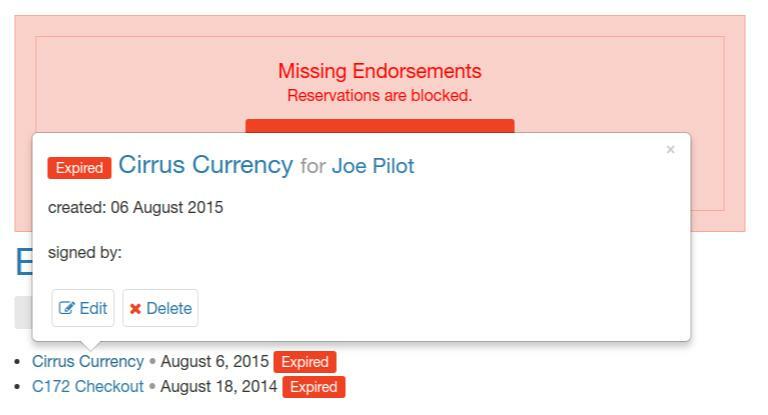 upload a copy of pilot certificate), while others require expressed approval (make/model checkout by a CFI). 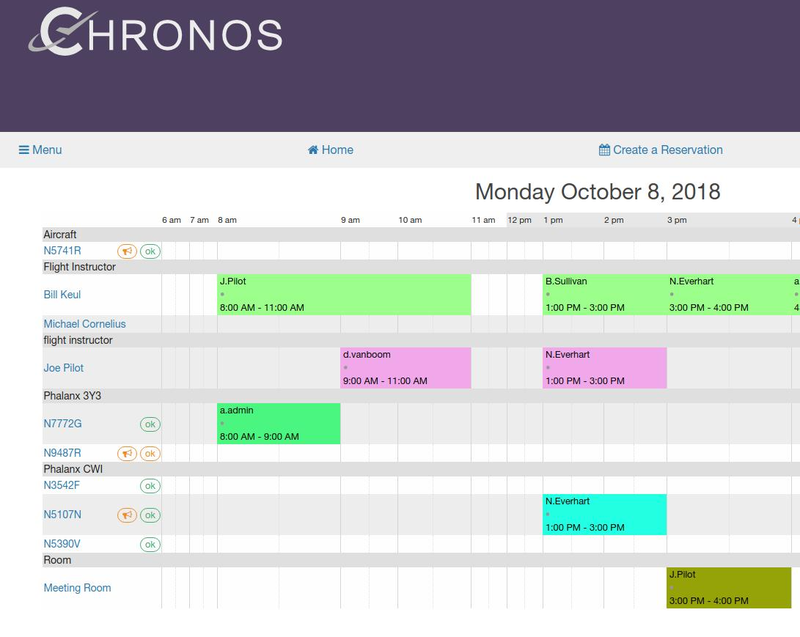 Chronos supports all types of policy enforcement including: expiration of solo endorsements, expiration of make/model checkouts, required document uploads, instructor endorsements. Customer access may also be restricted if they have a balance due on their account. Fill in your name, email address and password and click "Start Now". You will be redirected to FLY Online Tools to set up your service. Your Chronos service will be up and running in about 60 seconds and you will receive some helpful instructions via email. Follow the Quick Start instructions to log in to your server, upload your custom logo and brand colors. Configure aircraft, flight instructors, pricing, and policy control settings, then go live. Browse the online or contact support@flyonlinetools.com. You may be required to log in or create your FLY Online Tools account after clicking "Choose This Plan"
Follow this Launching Your Server help guide to commission your service. The process takes less than five minutes. Your first 30 days is billed FREE with no obligation. What payment gateways are compatible? Client listings, reservations and past usage data may be imported to help you make a smooth transition. All FLY Online Tools products are provided and billed as "Software as a Service (SaaS)" with no long term obligation or contract. You may discontinue your service at any time. Yes. Browser access is HTTPS encrypted for maximum security. Industry best practices are used to secure access and protect backup data. All data is processed in US based data centers located in New York and Dallas locations. Make sure that you and your staff establish strong passwords for admin and manager accounts. All software is developed in the USA. All data is processed and stored in USA based data centers. All copyrighted and copyrightable materials on this Site, including, without limitation, the design, text, graphics, pictures, sound files and other files, and the selection and arrangement ("Materials") thereof are copyrighted, ALL RIGHTS RESERVED, by HAFC. Except as stated herein, none of the Materials may be copied, reproduced, distributed, republished, downloaded, displayed, posted or transmitted in any form or by any means, including, but not limited to, electronic, mechanical, photocopying, recording, or otherwise, without the prior written permission of FLY Online Tools or the respective copyright owner. Permission is granted to display, copy, distribute and download the Materials on this Site for personal, non-commercial, and informational use only; provided that, you may not, without the permission of FLY Online Tools or the respective copyright owner, (a) copy, publish, or post any Materials on any computer network or broadcast or publications media, (b) modify the Materials, and (c) remove or alter any copyright and other proprietary notices contained in the Materials.